Humpback whales feed in the waters off-shore. A volcano is visible through the mist of a summer morning. Marine mammals are broadcast live on the radio. A strong and vibrant connection to two cultures – Tlingit and Russian – is visible in dances, storytelling, historic architecture and beautiful artwork. A wind-swept island hosts hundreds of thousands of nesting seabirds each summer. All this awaits you in Sitka, perched on the outside edge of the Inside Passage. Look for marine mammals and sea birds on the waters of Sitka Sound. Stroll amid the historic buildings of downtown Sitka, keeping your eyes open for a bald eagle soaring overhead or a sea lion splashing in the harbor. Venture away from town to explore the trails and scenic overlooks. Whatever you decide, settle in for a few days to experience all that Sitka has to offer. We’ve included some of our favorite wildlife viewing sites to get you started, but there’s much more for those with a keen eye and a healthy spirit of discovery. 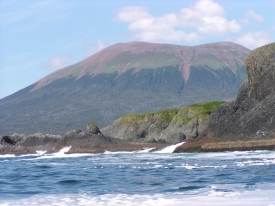 For information on tours and lodging, consult the Sitka Convention and Visitors Bureau. Visit their website at www.sitka.org or call 907-747-5940.